I used to let my hens free range without plans to ever use chicken tractor, thinking I was doing them (and myself) a favor. Great yolks come from a chicken who can eat bugs and all, right? Just add chickens, and you’re done! Our hens were allowed to free range because I think a pasture-raised chicken is a healthier chicken. We also originally got them for bug control – with horses comes manure, and with manure comes flies and mosquitoes. And they did a great job keeping those populations under control. When my dog started attacking my hens, I didn’t get it. Yeah, I’m not too smooth. Plus, there was all those freeloading mosquitoes still milling about. The dog was put in a pen, and the chickens were allowed to continue to free range (in reality, it turns out my dog is a Houdini, so this wasn’t a great solution). 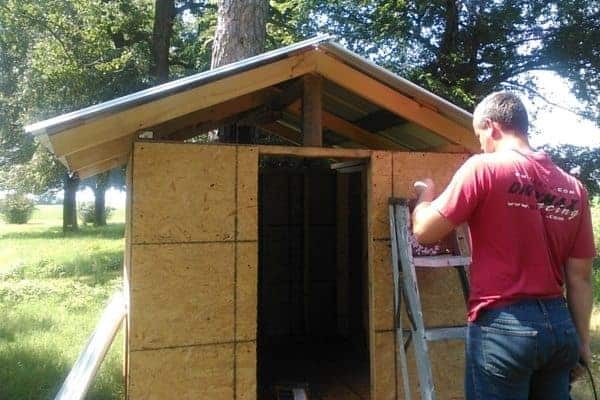 It wasn’t until Mrs. Leedle, my reliably-laying production red hen, mysteriously disappeared one day (I suspect a hawk got her), that I decided it was time to build a chicken tractor. Winter was coming, and the mosquitoes had gone under ground, and we had a lot of time for projects. 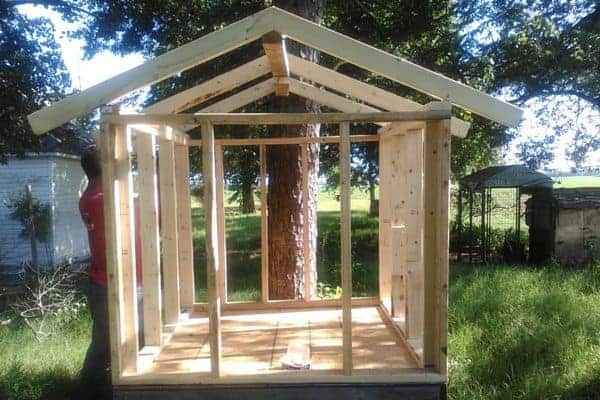 Building a simple but effective chicken tractor turned out to be an easy project, and, with our plans, that took only a few hours. Luckily, our chicken flock still thinks it’s the bee’s knees. 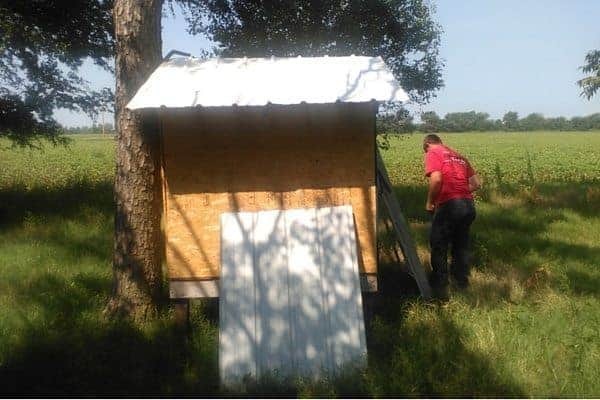 Your chicken tractor can be any size or shape, as long as it keeps them safe from predators, can be moved, and has some way to provide them shade and water. For us, this chicken tractor handles the overflow from our main coop, and we’ve set up a second flock of our hybrid chickens we’ve bred on the farm. So, for this tractor, we wanted to house 5 or so chickens, since the purpose of a chicken run is to let them free range while protected. We first started out with pallet wood for the base, which was free. Each piece was 5′ long, and made of solid wood that had been heat treated. 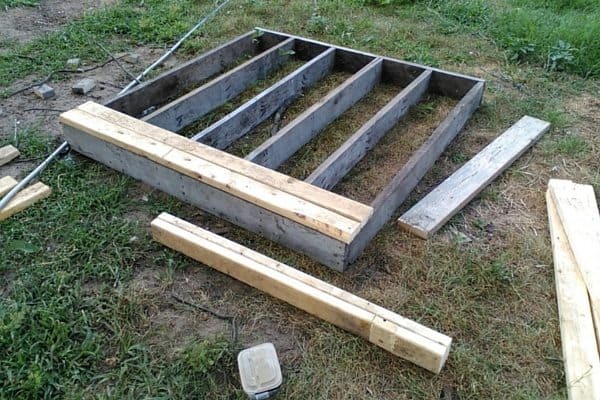 If you want to construct your chicken tractor out of pallet wood, be sure to check if it’s safe for you to use. Some pallet wood is safe, while some isn’t. If you’re not sure where to get pallets, you can read about it in my article, How to Use Pallets for Homestead Projects. 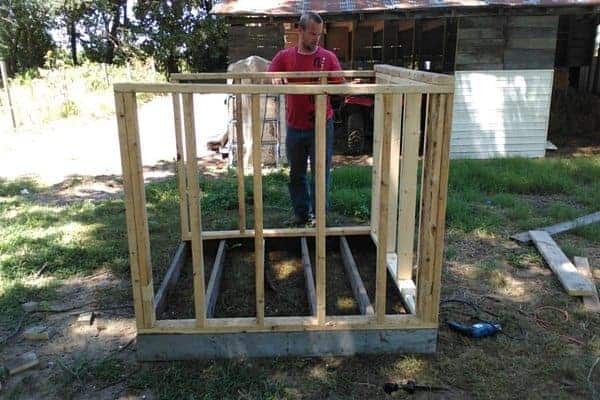 After we constructed the base of the tractor with the pallet wood, we then began framing the chicken tractor using 2x4s that were custom cut to 5 feet. Once the base of the tractor was complete, we added a floor using 1/2″ plywood, which gave our new chicken flock a firm place to stand and rest. After cutting the plywood to fit the 5’x5′ base, we screwed the floor down using 4″ wood screws. In this photo, my husband is mocking up the frame, before we screwed the frame in, we added the plywood floor. Once the base was complete, we began framing the tractor using 5′ 2x4s. 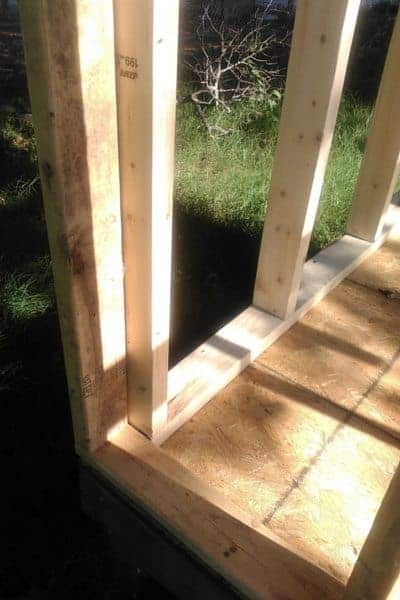 Constructing each wall was simple, just a matter of screwing a 2×4 to the base, then creating a sturdy wall with studs to support the frame and roof. 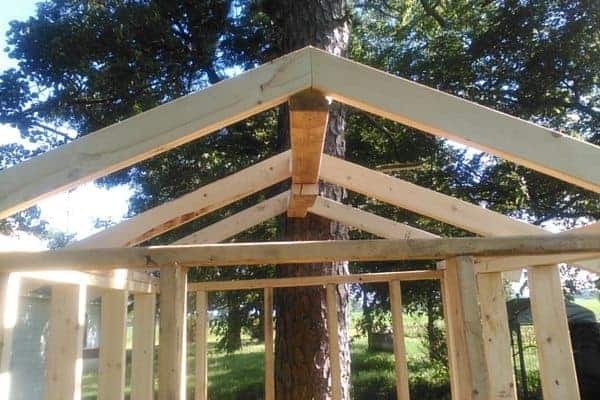 While we screwed the frame to the base, we also stabilized it by adding an additional beam on the back and the front that attached to the two side walls. On three walls, the two sides and the back, each 2×4 is 12″ apart, and screwed to the top and bottom of the frame. We double studded each corner for extra support. In the end, this was a matter of just cutting wood for the chicken tractor, then screwing it all together. For the doorway, we left a 16″ gap in the center so the chickens can easily get in and out of the tractor, and so I can get in to clean it out easily. Framing the roof of the tractor was easier than you’d think. 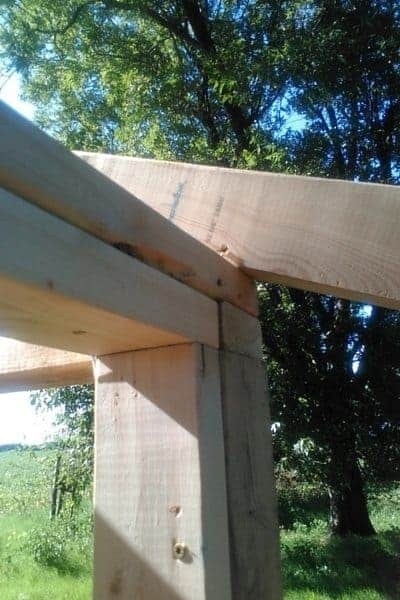 Using a miter saw, we angled 2x4s to 22 degrees, then attached them to a center beam with 4″ wood screws. We affixed them from underneath the beam and upwards, angling the screws so they firmly attached to the 2x4s. We made sure to leave a 8″ overhang so rain could easily slide off the roof without getting into the chicken tractor, leaving our birds dry in stormy weather. We also affixed the roof beams to the main structure by angling the screws downward and into the frame. Once the frame and roof were secure, we added 1/2″ plywood to to complete the exterior walls. We used 4″ wood screws and drilled them in every 4″ into the studs to secure them into place. We knew we wanted to leave a 4″ gap between the top of the wall and the roof for ventilation; we weren’t worried about rain because we left an overhang in the roof. Hardware cloth added to the 4″ gap will keep out predators and keep any chicken with wander-lust in. 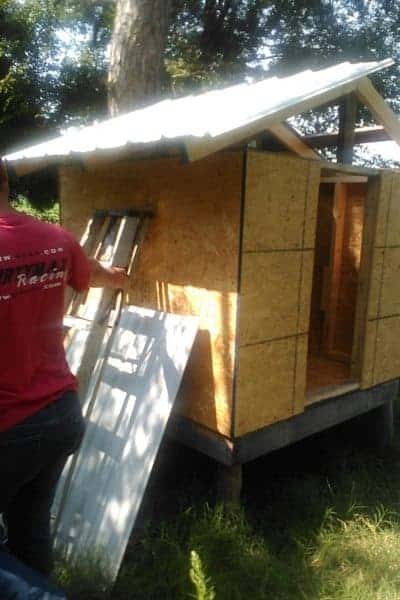 To the triangular gap over the door and over the back of the coop, we added hardware cloth for more ventilation, and we can either put a tarp over it for the winter (easy removal in the summer), or enclose it fully with plywood. For this project, we used corrugated sheet metal for the roof, and we chose white so it reflected heat in summer. It was also relatively inexpensive. The roof was affixed to the roof studs with metal screws drilled directly into the studs every 3″. Here’s the hardware we used for this chicken tractor. That’s it! 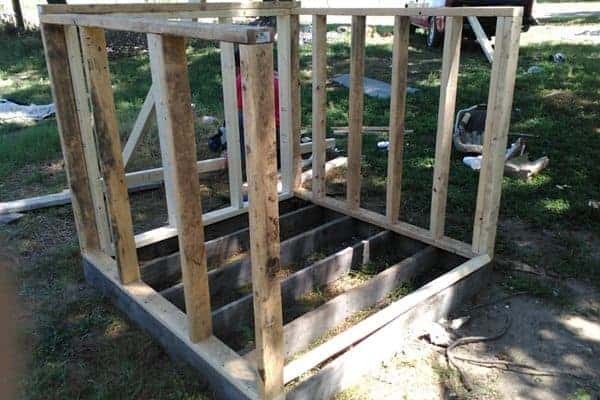 Building a chicken tractor is a fairly simple project – once you have your plans in place – that can be done in a couple of hours. Your chickens will thank you when they’re able to hang out in the sun, dust bathe, and scratch for goodies and still be protected. 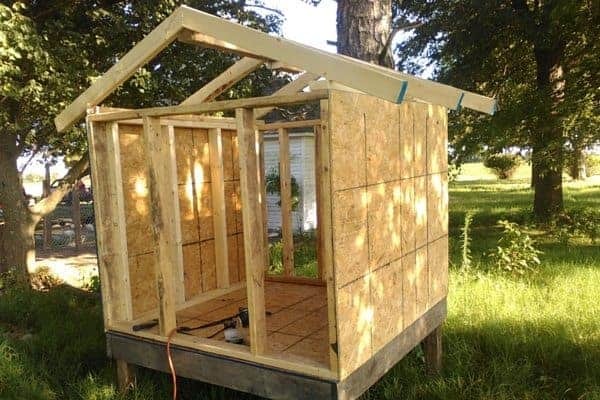 Building a chicken tractor is easy with these simple plans. 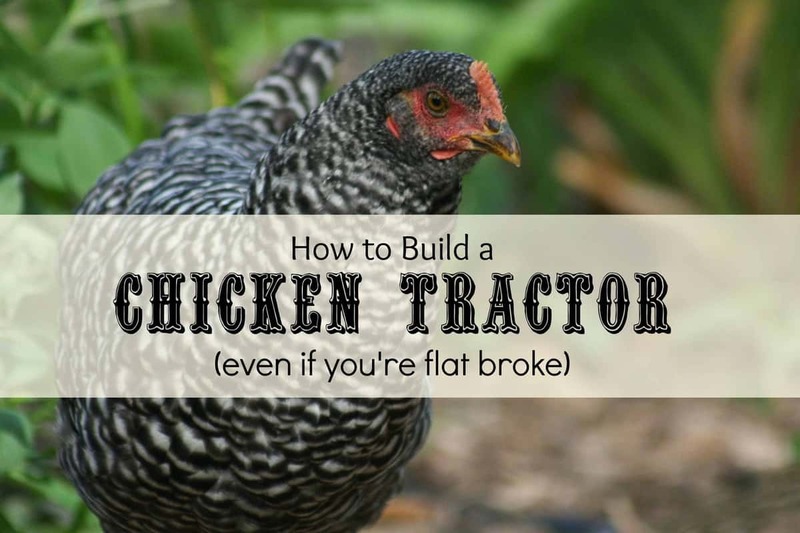 You'll learn how to build a chicken tractor even if you're flat broke. I made a chicken tractor similar to this last year. It was no problem getting the chickens in there, not so much when it came time to get them out. How do you catch your chickens to get them back into the main coop? Mine go wildly insane for egg shells, so I just show them that I have them, and they follow me into the coop. The younger ones, I just grab them, but they’re used to being handled. You could even put wheels on the corners to make it easy to move!! Thanks for the wonderful idea!! That’s our next improvement on it! We’ve been trying to find wheels for a week or so, guess we will have to get some on Amazon. Nothing local to be found! Glad you like it! HOW ABOUT LOWER THE LONG SIDES ABOUT AN INCH OR SO AND ADD STRIPS OF RECYCLED PLASTIC BARREL STRIPS….KINDA LIKE A SLED. I WOULD THINK THAT WOULD MOVE PRETTY EASY. ATTACH A PIECE OF ROPE TO PULL IT AROUND…..????? try your recycle yard for wheels. they usually have a bunch of old mowers around with good wheels. coop each evening they will hop right in.